Leather bags: love the look, suffer under the weight. I can no longer sling a leather shopper the size of a Mini Cooper over my shoulder and charge around all day. Leather bags have to be small. But mostly, I'm hunting for microfibers. If you, too, are minding the weight of a big leather bag, here are some light options. Groom Paris' MV 28 is a small leather bag (14 x 28 cm or 5.5 x 11 inches), that carries the essentials. Available in a variety of delicious colours; shown, tilleuil. Price, 210 €; available from Groom's online store. Groom's microfibre bags are durable, washable and chic. Shown, the Clone, price, 113 €. The 53 x 30 cm (20 x 12 inches) bag has an outside zip pocket and an ingenious little pocket on the padded strap for your phone. Padded strap, best thing since the underwire bra. 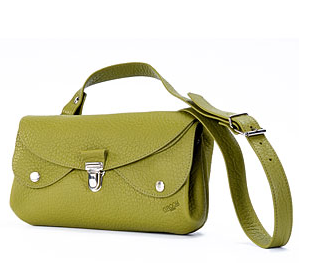 Wear Mandarina Duck's Jaipur bag in the hand, over the shoulder, or wear cross-body. Measures 46 x 22 cm (18 x 8 inches), big enough to carry a book or magazine. From Mandarina Duck's online store, price, $203 on sale. Available in blue, black, and a subtle grey evocatively called "marine". 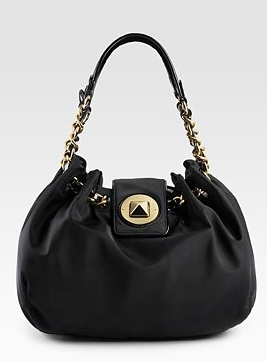 Kate Spade's nylon Mae Hobo has a pyramid stud closure and chain-link and patent straps that lift it above functional. Size, 13 x 9 inches; price, $325 from Saks Fifth Avenue. And yes, metal feet! 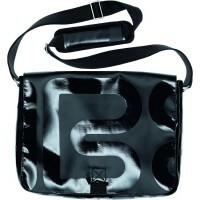 Bree's Punch 49 messenger bag is made of an edgy glossed tarpaulin fabric, with a padded shoulder strap. Size, 38 x 28 cm (15 x 11 inches). Price, €95,95 from Bree's online store. Bree bags wear well. 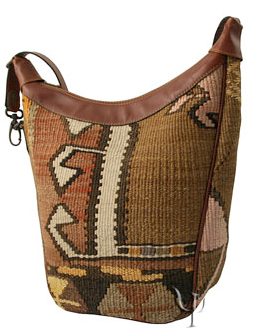 Lovers of ethnic textiles might choose a woven kilim shoulder bag with leather trim, $147 from Yurdan; many other styles available on the site. Of course it's what's inside the bag, too. I'm toting one-third of what I used to hoist. A few more dreamy thoughts on the streetcar instead of reading a book, but far less neck strain. And with good deep coat pockets, sometimes I can skip the bag entirely! Oh,my....me too! I've long thought how silly it is for women to "have" to carry purses. Now that I've have an unfortunate back problem, I can no longer schlump around with an extra load - much of which I never use while I am out. I have donated ALL my biggie leather bags and am on the hunt for a microfiber shape that I like. The small cross over bags like Coach look great with nothing in them but put in a pair of sunglasses and a phone and they are no longer streamlined. My "must haves" include a zipper top - no more open tops or fumbling flaps for me -and a durable & comfortable strap. Actually, the bag hunt is a metaphor for what is going on with the rest of my life - editing, only keeping what I really need, and lightening the load to focus on life. I sooo love your posts and identify so much with your writings. I still love a leather bag, but have also been mindful of weight far more in recent years. I've seriously eliminated much of what I lug around and have to fight grumpy feelings when, for some reason, I feel compelled to carry more. I've also learned that I like a bag I can carry in my hand, as impractical as that sounds, or avery short strap I can tuck in at elbow height. Shoulder straps and cross straps bother me more and more as I age, and backpack bags always hurt my back more. I like that 5.5 x 11 inch bag from groom, and it is about what I consider the perfect size at the moment. I will look into it. But some of your other options are really intriguing too so perhaps some looking around is called for on my part. Thank you for posting about one of my fashion pet peeves. The last leather bags that I considered buying I decided against because they were just so darned heavy...and that was before I put anything in them. One of the reasons why I wear cargo shorts and pants on weekends is that I can put my phone, keys and wallet in the pockets and not have to carry a bag at all. One caveat: I was considering a microfiber from Nordstroms last year, but was put off by the comments. Many people said the HARDWARE was too heavy and made for a heavy bag! I don't see that as an issue on your great selections, but it's something to be aware of. Once again, Duchesse, I feel that you've read my mind. Yesterday, tired of the weight of last years' (beautiful elephant-gray and elephant-heavy Banana Republic leather tote) bag, I searched online for a smaller, but still roomy handbag. All seemed so expensive, and so full of unnecessary tassels and hardware, I gave up and went to my favorite neighborhood thrift shop. There I found a truncated-trapezoid (stylishly wide but not too deep--good for a short person like me) Groom bag in a mouth-watering mulberry pebbled leather, like new--for $25! That led me back online to look up Groom bags. They really are beautifully designed--very simple and sleek, in great colors. And what a thrill to discover that my thrift-store "Swan" bag had cost $500 less than a new one! I looked at the bags and read your words but I have been smitten with the pearls at the top of your blog...as a pearl girl I must ask where did you find these beauties? Can we see them in another image ? You mind reader! I'm liking Lug nylon bags. I'm still in the "carrying work files and diapers" years. I found that twin toddlers required going hands-free as much as possible, and am a huge fan of belt bags. Leather's not such a bad thing, there. This is why I've shifted to M0851 for my last two bag purchases. They use a lighter leather and they are not weighted down with zippers and other paraphernalia. As well, the width of the shoulder strap means the weight is more comfortably distributed. Your suggestions are all great, as well, when a smaller bag will suffice. And, like Mardel, I really like the option of being able to carry a bag in my hand -- because I'm likely to walk kilometres and kilometres in a day, I like to be able to shift the pos'n of a bag and having a nice short strap allows that. Mary: Yes, no more open tops! And 'lighten the load', words to live by. Mardel: I too get crabby when carrying any weight, but need both hands to deal with streetcar and subway. Belle: Doesn't it feel wonderful to just use your pockets! Frugal: That's why I've shown the choices I have! Vera Bradley a deliberate omission. Anonymous: OMG, a thrifted Groom bag, nirvana! hostess: My pearls, from Kojima Company. dana: Agree,microfiber briefcases are great, more utilitarian than those shown but very useful. With twins you need to pack a lot of gear! ma: I'll overfill any bag bigger than a book! Occasionally carry a handbag but need shoulder one easier for city transit, both hands free works best on subway. Duchesse, I wasn't thinking about the subway. When I was in NYC frequently a shoulder bag was always preferable. Somehow I always end up with a bag or something in one hand anyway. As a petite woman I've "tried on" some of the bigger bags and fortunately that way I saw that they overwhelm me and I never bought one. Sometimes I have to carry around a laptop, treeware work or shopping, so I can't imagine doing without some kind of bag. My healthy back choice is the Ameribag, but the Groom microfibre bag looks prettier and the colours are sumptuous. On my bicycle, I have Dutch saddlebags though, bought at a street market in Amsterdam. It makes me uncomfortable looking at commuters cycling with heavy backpacks. Ow! lagatta: Some of those bundle buggies are very hip :) Don;t have one... yet! If carrying work, I use a rolling briefcase or a big leather carryall, which hurts. I've got lots of microfiber for travel, but not much for every day -- have downsized to a smaller leather hobo for the essentials, now that I'm not lugging around the Filofax. Rubi: My Filofax, which I still use- I like its look and heft- stays on my desk. LPC: Just keep bench pressing and you will never have to! Well, your ARE a mind reader Duchesse! Two weeks ago, I carried my lovely leather Furla shoulder bag on a sisterly shopping expedition. Six hours later I could hardly move my neck and shoulder. What happened? Being laid up with the pain and a few muscle relaxers, I jumped on the net and purchased another beautiful Longchamp Le Pliage bag. 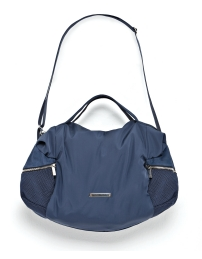 This one is metallic pewter coated cotton with a subtle Longchamp signature pattern running across the bag. Two small leather top handles ensure it does not migrate back up. It can hold a small family, but for now just the essentials. I am in love! Nice bags all, but for practicality you just can't beat a Baggallini Baby Milano bag. Perfect size for a day bag. Manages to be durable and chic at the same time, comes in a large choice of colors. Has lots of pockets and zippered compartments, pen and lipstick slots, a magnetic-close cell phone compartment, even room for a magazine on one side. Designed by flight attendants. I love my Longchamp Les Pliages, but tired of not being able to find things inside. Planned to use it only while traveling abroad this summer, but now it's my go-to bag. Marguerite: Le Pliage is beloved by many and has the advantage of easily storing in luggage, etc. Thanks! Anonymous: Thanks for bringing Le Bagellini into the lineup. Guess I should buy stock in companies making good looking microfiber or nylon bags, we seem to need them. I bought a hyacinth blue Longchamp Le Pliage on half-price sale this summer. It is the second largest one they make and has a long handles to go over my shoulder. As I am tall, it is just the right size for me. I love it. I wanted a tote large enough to carry & disguise my Built neoprene lunch sack and still hold other thing. Yes, it is sometimes hard to find things inside; I've resorted to using small, cotton zipper bags in various colours to hold stuff. It's easy to identify what I need quickly.